With the new year upon us, it’s time to kick into resolution making. We write down and discuss our hopes, dreams, and visions for the new year, and lay out the steps and action plans required to get there. But, it occurred to me this year that so many of the resolutions I set for myself for 2018 I didn’t reach… and I was okay with that. How can we really know what we want? How many of us change course over a year’s time? Modify plans? Restart entirely? Life isn’t linear, but rather an unfolding process. So much growth and evolution happens in a year – so, my only real resolution for 2019 is to outgrow the goals my small mind could set today, because the year shows me how much more is out there for me. I asked the Next Gen Community about resolutions and goals they set in 2017 that they didn’t end up achieving for whatever reason, and it turns out, shifting away from specific resolutions is pretty common. We may start the year with boisterous business goals. “This is the year that I’m going to make X figures!”, we tell ourselves. But, sometimes, once you get into the thick of it, you realize business can’t be a priority after all. Cheyenne Noelle reflected, “I didn’t reach my business expansion goals because I realized I first needed to prioritize my self-care, my health. We must be willing to sacrifice our picture of how the year is supposed to be to respect ourselves and what we need. Meghan Sharkus was clear when she began 2018 on specific revenue goals for her business and fitness goals for herselves, and she made these goals numerical – i.e., amount of money and number of pounds. As 2018 started, she realized she would have more luck if she changed how she measured success. So, rather than forcing herself to lose the number of pounds she originally insisted on losing, she changed weekly goals to upping the number of fun fitness classes per week and improving athletic skills, like rock climbing. As for business, she also changed her units of measurement. Rather than focusing on revenue alone, she shifted into measuring more specific factors that determine revenue. “It made me realize that focusing on the bottom line is important. But focusing on what drives the bottom line is even more important,” she shared. Meghan wasn’t the only one who realized that setting numerical goals for herself wasn’t as effective as deep-diving into the strategy behind achieving those numbers. For Jaclyn DiGregorio, a health coach and the founder of the CUSP Method, her biggest New Years Resolution was increasing the number of followers for her startup’s Instagram. Once she dug into the ‘how,’ she realized her real goal was offering premier, high value content so the following would grow itself. Instead of expanding, she doubled down on the LA market – which she calls the best decision she’s ever made. She couldn’t have known to do this without first trying to expand – but, it just goes to show how resolutions are limited in their scope. We must be willing to outgrow our resolutions to truly know we’ve achieved something in the new year. When you sit down to pen your list of goals and resolutions, keep in mind that there is so much you don’t know at this moment. Rather than putting down specific numbers that you hold yourself to achieve, assess your performance in your professional and personal life in terms of the value (i.e., non-numerical) that you bring to yourself and to others. Dig beneath the superficial goals – if it’s money or a following you’re after, make 2019 about aligning more centrally with your purpose, or learning more about how to scale your business or hone your message. It’s an important tradition to use the turn of the year to reflect, reassess, and lay a plan of action – make sure that your resolutions situate you in a growth mindset, and a willingness to outgrow what you think you know now for something bigger and perhaps, something fated for an amazing 2019. 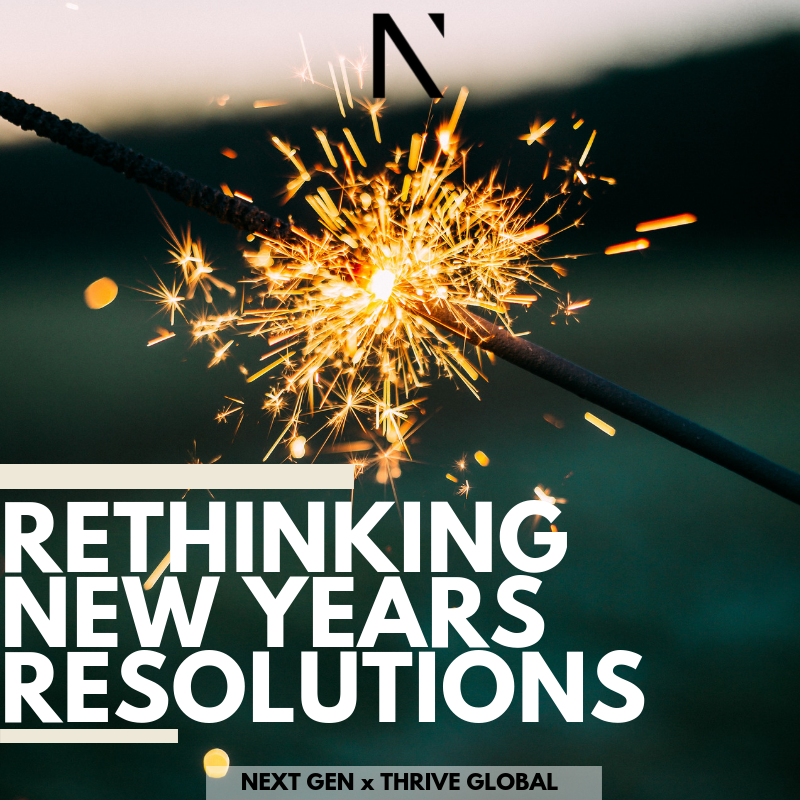 To join a tribe of young movers and shakers who are making 2019 the best year yet, join the Next Gen Community here.